Alabama’s abortion report for 2017, published in October 2018, shows that abortion totals in the state are falling. Planned Parenthood’s abortion market share has shrunk after several negative health department inspections. *Information is for all abortions reported in Alabama. Information on Alabama’s state abortion rate is not publicly available. Abortions occurring in Alabama fell by nine percent from 6,642 in 2016 to 6,063 in 2017 (Fig. 1). Since 2005, total abortions have dropped by 46 percent. Chemical abortions also decreased, dropping eight percent from 2016 to 2017. 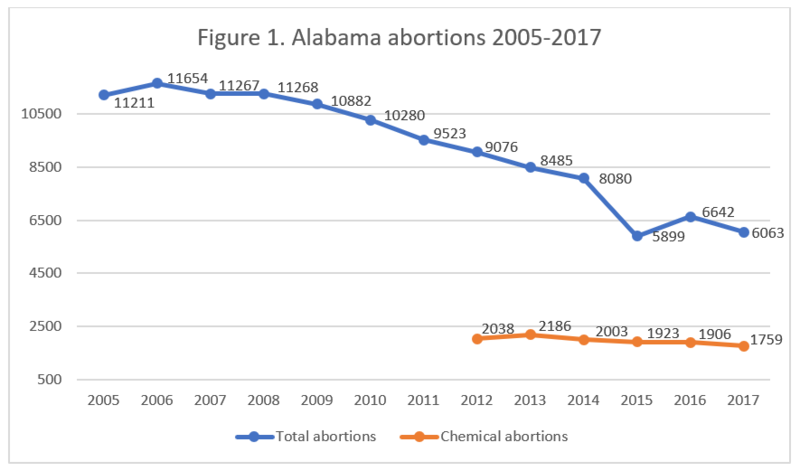 Chemical abortions made up 29 percent of all abortions reported in Alabama in 2017. While Alabama does not report the state abortion rate, the Charlotte Lozier Institute estimates that the rate dropped slightly from the previous year (Fig. 2). Abortions performed on Alabama residents declined by almost three percent from 2016 to 2017. Alabama reports its resident data separately from the occurrence data. Resident abortions include those performed on Alabama residents in other states, although the report cautions that not all states report abortion data back to Alabama. The occurrence data includes all abortions performed in Alabama, whether on residents or nonresidents. Most of the demographic information in the annual report is for abortions performed on residents, whether the abortions took place in Alabama or in other states. Sixty-one percent of the resident women getting abortions were in their twenties, and 10 percent were age 19 or younger, including three percent under the age of 18. Twenty-six percent were in their thirties, and two percent were age forty or older. The majority of resident abortions, 62 percent, were performed on black women, while 34 percent were performed on white women and three percent on women of another race. CLI estimates that the black resident abortion rate was 13.9 abortions per 1,000 resident women of childbearing age, nearly four times the white resident abortion rate of 3.7. However, because not all resident abortions are reported to Alabama, both rates are likely higher. Eighty-seven percent of the resident abortions were performed on women who had completed at least 12 years of education. Thirty-five percent had finished 12 years, and 53 percent had finished 13 or more. Eight percent had completed fewer than 12 years of schooling, and five percent did not report their level of education. As in other states, the majority (88 percent) were unmarried, while 11 percent were married. More than a third of the abortions performed on Alabama residents, 37 percent, were on women who had no previous live births. Twenty-nine percent were on women who had one previous live birth and 34 percent on women who had two or more. Almost two-thirds of the women getting abortions had never had an abortion before. Twenty-three percent had one previous abortion, and 11 percent had more than one. Twenty-one percent of the abortions performed on Alabama residents were performed at six weeks of gestation or earlier. A little over a third occurred between seven and eight weeks, and 30 percent were performed between nine and 12 weeks. Eight percent were performed between 13 and 15 weeks, five percent between 16 and 19 weeks, and two percent – 116 abortions – at 20 weeks or later. There were no abortions performed after 22 weeks of gestation. In Alabama, abortion is prohibited after 20 weeks post-fertilization (approximately 22 weeks of gestation, or five months of pregnancy) unless a pregnancy poses a serious risk to a woman’s life or a major bodily function. Neighboring states Mississippi and Georgia also restrict abortion at this point, Mississippi at 20 weeks of gestation (18 weeks postfertilization) and Georgia at 20 weeks postfertilization. Separately, Alabama reports information on all abortions performed in the state on residents and nonresidents alike. Black women were in the majority at 63 percent of the women getting abortions, and white women composed 34 percent. Three percent were another race. The abortions performed in Alabama had a similar age distribution to the abortions performed on Alabama residents: 11 percent of the abortions were performed on females age 19 or younger, 62 percent on women in their twenties, 25 percent on women in their thirties, and two percent on women age 40 or older. Alabama requires parental consent before an abortion may be performed on an unemancipated minor; girls may petition the court to waive the parental consent requirement. In 2017, 192 abortions required parental consent. In 194 cases, parents gave their consent. Courts granted a waiver in four cases, and the outcomes of the remaining three cases were not stated. The report did not indicate whether courts declined to grant any waivers. 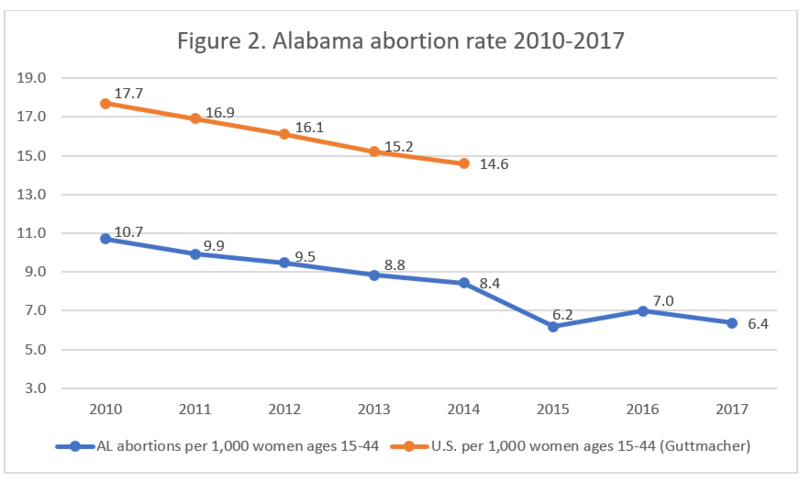 Length of pregnancy for all abortions reported in Alabama is calculated in weeks post-fertilization, unlike length of pregnancy for resident abortions, which is calculated using gestational age. Gestational age measures a pregnancy from the first day of the woman’s last menstrual period, unlike probable post-fertilization age, which measures from the date of conception (typically two weeks after the woman’s period). Ultrasounds were used to determine probable post-fertilization age for 6,061 of the abortions, while post-fertilization age was not determined for one abortion due to a medical emergency. The report does not specify how age was determined for the remaining abortion. In 2017, more than half of the abortions reported in Alabama – 54 percent – were performed at six weeks post-fertilization or earlier. Twenty-one percent occurred between seven and eight weeks, and 10 percent were performed between nine and 10 weeks. Seven percent took place between 11 and 12 weeks, five percent between 13 and 15 weeks, and four percent between 16 and 19 weeks post-fertilization. Two abortions were performed at 20 weeks post-fertilization, both of which were performed due to medical emergencies. One woman was experiencing severe eclampsia or preeclampsia, and another had advanced cervical dilation and bulging bag of water. According to Alabama law, abortions after 20 weeks must be carried out in a way that gives the unborn baby the best chance for survival, unless doing so would put the mother at risk. Both of the abortions at 20 weeks were performed using procedures that would give the babies their greatest chance of survival, but the report does not indicate whether either baby was born alive. Alabama requires doctors to report whether a lethal intra-fetal injection is used to kill the baby before the abortion. In 2017, intra-fetal injections were used in two cases. In 2017, Planned Parenthood’s Alabama market share continued to shrink. The percentage of Alabama abortions performed at Planned Parenthood fell from 12 percent in 2016 to five percent in 2017. After years of safety deficiencies and violations, a 2018 health department review of Planned Parenthood’s Mobile center noted that the center was in compliance with most requirements, but that no abortions had been performed at that location since March 2017. A 2018 health department review of the Birmingham center also acknowledged that Planned Parenthood was in compliance and stated that the last documented abortion at that center was performed in September of 2017. In April 2018, Planned Parenthood announced plans to move its Birmingham center to a new downtown location. In 2017, West Alabama Women’s Center was the state’s largest abortion provider, performing 52 percent of the abortions reported in 2017. Alabama Women’s Center for Reproductive Alternatives was responsible for 26 percent, and Reproductive Health Services Inc. performed 17 percent. Six abortions were performed at hospitals. Alabama has attempted to ban dilation and evacuation (D&E) abortions, commonly known as “dismemberment abortions” because the unborn child is torn apart during a D&E procedure. Dilation and evacuation is the most commonly used abortion procedure after 15 weeks of gestation. In 2016, Alabama passed a law prohibiting this method of abortion, but the law was blocked by a federal district court decision. The 11th circuit court of appeals upheld the decision of the district court, preventing the law from going into effect, but took the opportunity to criticize the reasoning used in Roe v. Wade and encourage the Supreme Court to revisit the issue. Alabama has asked the U.S. Supreme Court to hear the case. In 2017, there were 183 D&E abortions and 26 abortions performed with combined induction and D&E in Alabama, for a total of 209 abortions performed with dilation and evacuation. Dilation and evacuation abortions made up three percent of all abortions performed in Alabama. A CLI study of state abortion reporting ranked Alabama at 12th place out of the 50 states, New York City, and the District of Columbia. By reporting information on abortions after 20 weeks and the parental consent process, Alabama’s reports allow citizens to determine whether laws are effective and whether any exceptions are being made. Including information about the centers that perform abortions lets citizens and researchers track abortion trends in the state. Still, Alabama could improve its reporting by requiring doctors to report any complications resulting from abortion – particularly since some of the abortion centers in the state have a history of safety violations. Alabama could also make its resident and occurrence data more comparable by reporting how many of the abortions performed in the state are performed on Alabama residents. Alabama does not report the state abortion rate. Rates were calculated by the Charlotte Lozier Institute using population estimates from the United States Census Bureau. The rates were calculated using the following formula: (total number of abortions performed in Alabama ÷ number of resident women ages 15-44) x 1,000. Rates have been revised slightly since the last report due to updated population estimates.